With his Planetary Project, Aleksandr Bezgodov tackles the formidable task of saving the planet. The planet is not only in peril from global warming, he states, but also from the heedless pollution and expenditure of limited natural resources. Moreover, the disproportionate utilization of these resources by a select group of businesses and nations is concomitant to a lower standard of living for some nations and groups of populations. This inequality between regions and disparate groups of people, Bezgodov observes, leads to unrest, terrorism and the possibility of a nuclear war. He also points out that an impoverished citizenry doesn’t have the requisite means or tools to conserve or replenish resources. Bezgodov believes that previous approaches for addressing the environmental crisis, such as the Sustainable Development Movement, are insufficient because they fail to recognize the connection between economic distress and ecological destruction. In place of the previous approaches, the author advocates a new paradigm, which he calls “Managed Harmony.” The “Planetary Project” of the title is the means by which the world would be gradually transformed to meet this paradigm. 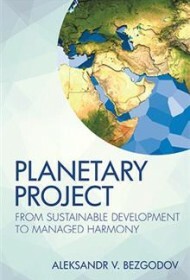 Under the auspices of the Planetary Project, “a system of planetary governance bodies” staffed by the world’s elite (primarily scientists) would address not only the problems of global warming and economic disparity, but also other pressing issues such as over population, the threat of pandemics and collisions with asteroids. Bezgodov, who holds doctorates in economics and political science and has penned over 50 scholarly publications, offers an admirably thoughtful plan for the underpinnings of his project, and his work would represent a significant entry into the discussion of current environmental issues. Unfortunately, his text is heavily marred by grammatical problems. Run-on sentences, fragments, subject-referent problems, and malapropisms, along with an extremely prolix style, make his book an extremely challenging read. This is a shame, as his ideas deserve a platform. This book could find a wide audience, but only with careful and detailed revision.